The VCE Solo Task asks the student to not only create scenes that develop the ideas of their chosen structure but to be able to transition between them. These transitions and the use of space as a performer can play a vital role in lifting a solo performance from a simple series of scenes to a complete performance involving all the elements of non-naturalism such as space, focus, sound, rhythm, and heightened language. The VCE Theatre Studies Monologue asks the performer to create ‘a world of the play’ through the monologue and students to justify choices they have made and use the space rather than simply ‘stand and deliver’. Use of space and physicality become key elements in interpretation of a monologue. So this workshop can be adapted to that area if the school is only doing Theatre Studies. This workshop focusses on the key areas of: what are transitions, how are they created and how can they be used. In the first half of the workshop, using a range of exercises students will create transition skills that involve movement, sound, language repetition, song, sound and rhythm. These transitions will be developed either from a common stimulus given by the workshop facilitator, or created from the students chosen Solo Structure. The second half of the workshop then focusses on how to apply these transitions in performance space and how they can be used to lead from one scene to another, at the same time reaffirming the chosen structure, themes and ideas the students are trying to portray in the performance. Improvisation is a key skill in performance creation and used as a rehearsal process globally by theatre practitioners and directors. This workshop links to the Victorian Curriculum F-10, Levels 8, 9 and 10. 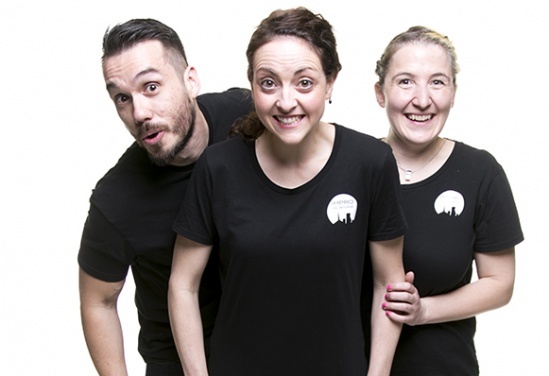 Impro Melbourne's teachers are passionate, highly experienced professional actors who love inspiring creativity in students. They teach at various arts institutions, including the Victorian College of the Arts, St Martin's Theatre, Melbourne Polytechnic, NICA and Malthouse Theatre. They bring their unique understanding of creative performance and theatrical skill to open up and de-mystify the VCE Drama tasks for teachers and students alike. This workshop focuses on the key areas of Character development and of transitions, how are they created and how can they be used to elevate a performance such as the Solo task of VCE Unit 4 Drama. Minimum fee: $347 + GST. Additional fees apply for regional tours. Please contact us on 03 9644 1808 or education@rav.net.au for more information. Booking info: Technical Requirements: Require space large enough for all students to be standing and moving freely around. Workshops can be noisy so need to be in area that will not disturb other classes.